The Very FIRST Sounds of Reading Success! This book focuses on the consonant sounds Bb, Cc/Kk, Dd, Ff, Gg, and Hh. 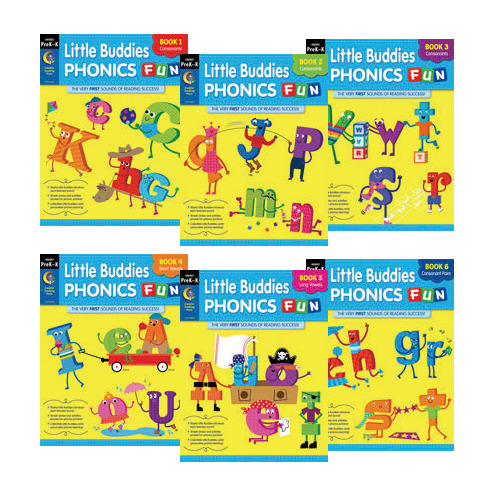 The Little Buddies Phonics Fun series bridges the gap between looking at words and actually reading them! All six workbooks in this exciting new series work together as an early phonics introduction to the important letter-sound relationships that are an essential first step in early reading success. Each workbook includes six short, humorous stories - perfect for first-time readers - featuring a delightful cast of adorable Little Buddies, who make learning phonics loads of fun! Companion activities and color-and-read mini books encourage additional interaction with each letter sound. Plus, a fun chart on the back cover lets your child create personalized Little Buddies cards for extended phonics learning. Choose all six books to help your child leap into The Very FIRST Sounds of Reading Success!